This post will show you how you can synchronize tasks from your Microsoft Project planning with SharePoint. This is typically addressed to users/companies that do not want to invest in the full version of Project server, but can share task list and project information with some stakeholders. Here is a very simple project that contains 2 summary tasks with 3 subtasks for each of them. Open your SharePoint site, go on view all site content and click on Create. Note that you can also use simple task list, there are small differences in term of views provided. On Microsoft Project, click on the File tab, select Save & Send then click on Sync with Tasks List. Type site URL, and select your list. The following warning message will pop up. This is one of the limitations of the standard Microsoft Project to SharePoint synchronization. Only Manually Scheduled tasks can be sync. Microsoft Project will convert all your tasks from Auto Scheduled to Manually Scheduled. 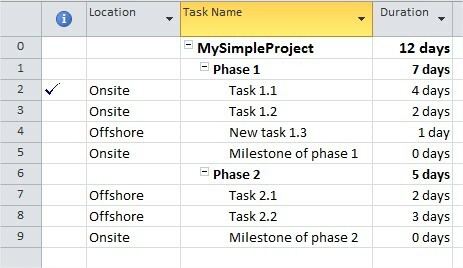 Summary tasks are supported and displayed. If you click on one of the summary tasks, you will find all sub tasks. Run synchronization, and check update in SharePoint/Microsoft Project. We already saw the default Gantt view; you can also create a calendar view. There is a standard feature in any SharePoint list or document library that allow user to be notified of any changes that occurs on any item of a list. To subscribe to notification, open List option and click on Alert Me. You will then have to select the frequency of notification and the type of modification to be reported. You can face some synchronization issues; the first type of issue is the conflict. The same item has been modified both in SharePoint and Microsoft Project. In this example the %complete has been modified in both sides with different values. The synchronization process pops up the conflict resolution windows to help you resolving this issue. Another synchronization issue is related to resource assignment. SharePoint can only synchronize resources that exist within its environment. In this example the user named “Test User 1” is assigned to a task in Microsoft Project but as it does not exist in SharePoint the synchronization cannot be done. The resource assigned to this task is removed in SharePoint. You can create custom fields in Microsoft Project and synchronized them into SharePoint. In the following example, I have created a text column called “Location” and assign some values. In Microsoft Project, select the File tab, and then click on Manage Fields. Select the Text1 (Location) project field. 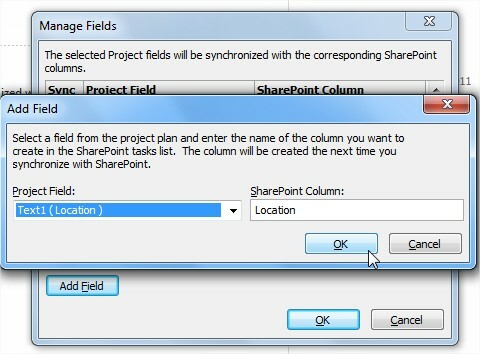 The corresponding column in the SharePoint list will then be created upon next synchronization. Modify the SharePoint List view to display the new field. Location is now displayed and synchronized. Do you have an issue with a sync between Project and Sharepoint generating an alert for every task because the sync registers as a change for every task, regardless of whether or not anything actually changed? Hi Mike, you are right, we receive an email for each task even if there is no change on it. I'll try to find something around this. With MSP SP1, the restriction that auto-scheduled tasks get converted to manual is removed. There are additional restrictions, however, to be aware of...e.g. links can only be Finish to Start; external dependencies are prohibited; custom fields are problamatic i.e. sometimes will sync, then subsequent runs will fail. Hello, Thanks for your comment. You are right SP1 add a lot of new interesting feature regarding synchronization with SharePoint. It’s very pleasant to share knowledge with other people. Thanks again for your constructive comment. Sync with Tasks Lists is not showing when clicking on Save & Send! Standard version of Microsoft Project 2010 does not have the Sync with SharePoint Tasks List feature. I keep getting this error: Ensure "task name" contains valid data and try again. I do the initial sync, add a task and sync which works, then add another task and try to sync and get the above error? I have seen others post this error but have not seen any answers yet. Finally, we have an IntelliGantt Web Part to presents a full hierarchy in SharePoint and also has a bevy of features. And, just because SharePoint 2007 is still out there, we made sure to support that as well. Let me know if you ever want a demo. @mebsjd, do you have any special characters in your task name? And what version of SharePoint do you use? I took all the special characters out, it seemed to start having a problem when I would change durations and then have parent task updated either automatically or manually and then hit the sync button. I wouln't get the special character problem, but would get the error "Ensure "task name" contains valid data and try again." I was having the same problem. make sure the task name does not begin with a space. Does anyone know how to change the sharepoint list view to make it look more like Project with the summary task shown and the subtasks indented? or even summary tasks bold. I realized that when you get "Ensure "task name" contains valid data and try again" happens when the project start date (or a task start date) occurs before the time you are uploading or syncing. If I shift the entire project time ahead of today (or whatever day you do this) upload and sync and then switch it back to the old date and sync again. Everything works just fine. To shift the entire timeline go go the Project tab and in the Schedule section click move project. Also getting alert on every sync even without any change. Mike Netzer? did you resolve that? I am receiving an error message saying the site is not valid or unavailable or I do not have the permissions. I have checked all three and it still does not work. Hi... Once I create tasks in MSP 2010 and sync them with Sharepoint 2010.. can i use this information to generate dashboard reports on my Sharepoint project site - i.e reports such as Planned vs Actual Work , Planned vs Actual Cost,Resource Utilization etc? - When you get "Ensure "task name" contains valid data and try again" happens, you can check that there is no empty or invalid tasks at the end of your project. Maybe you can try to select some 10-20 empty tasks at the end of your project and delete them in case there is one incorrect. - Regarding the alert, i discuss with experts and it seems it's not possible to do it without coding. There is no way to be alerted only by changes and not for all items. Last comment regarding the possibility to create dashboard in SharePoint (Posted by Anonymous on April 30), of course you can use this info, this is nothing else than a simple list, so you can create views and dashboards within SharePoint. How do you show all the subtasks in Sharepoint? At the moment I can see only the summary tasks, and then have to click on the summary task to see the next level down. Another comment that can be usefull, if you are connected to Project Server, the "with Tasks List" does not exist. Regarding display of subtasks, there is a workaround. You can create a new view and select "Show all items without folders" under the "Folders" setting. Invonveniant: the gantt chart is not visible anymore. Jeremy - When I sync to my sharepoint site, I can't see the detailed tasks, only summary tasks. Any thoughts? Hi, did you try to click on the summary tasks? I was able to resolve it by using the Sharepoint home page URL instead of the drilled down, detailed URL. You might want to play with the URL. I hope this helps. I discovered your SharePoint 2010/Project 2010 Sync issues via Google and read about a problem with an error message like: “Ensure "task name" contains valid data and try again”. Did you ever narrow the isssue down or did you clarify how to avoid it? Sorry I did not spend more time on this topic since this article. Actually I never faced it personally, so I did not dig into it. Hi Jeremy! Thank you for taking the time to create a post about MS Project syncing. I currently have MS Project Professional but I don't have the option to sync to SharePoint from File>Save&Send. Do you have any suggestions. Hi, I think that you have a connection to a Project Server set, in such case the Synch to SharePoint is not available. Try to remove this connection, close MSP and open again, this should be ok. Thanks for your advice and column! I am getting an error when trying to sync. "An unknown error has occurred while syncing to a SharePoint site. Ensure the SharePoint site is running and try again." Any ideas? I am running MS Project 2010 and SharePoint 2010.
i am facing some issue regarding with task synchronization between SharePoint 2013 and ms-project professional. I am sharing with you kindly give your valuable suggestion . 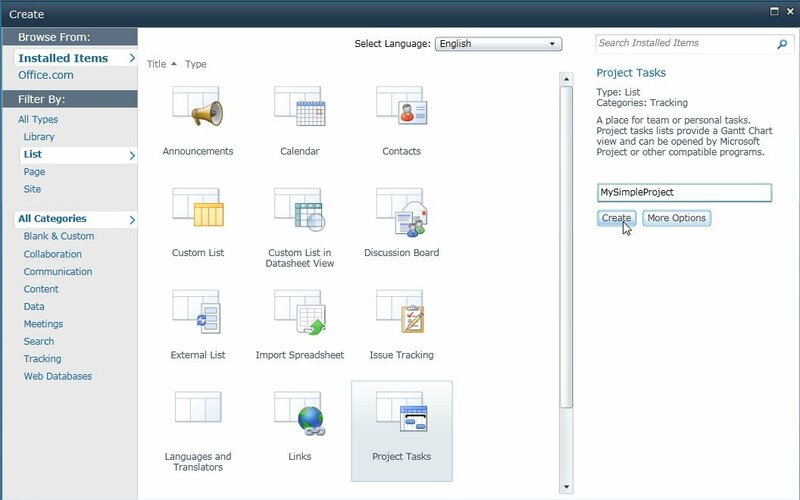 I created one enterprise project and added some tasks using Ms-Project Professional 2013. These tasks are only editable using ms-project professional though the enterprise project feature is activated. I assigned those tasks to specific users so those tasks are showing to their my sites task list from different project site once the data will crawl. Now users can edit those tasks from my site and modify the %complete columns once the task will complete. So these changes are not reflected to main project site task list and also those are not shown when this tasks(projects) are opened using ms-project professional. So can we make it as two way synchronous?How those changes ( modified from the my site task list ) can be reflected to ms-project professional and to the main project site tasks lists? I am running Window XP. IE7 project Pro 2010 and SharePoint Foundation 2010. When I try to sync a project to SharePoint it will build all the task lines in SharePoint but hey will be blank and the error I get is "Unable to write information for task "Task name" to SharePoint. Ensure "Task Name" contains valid data and try again." Doesn't mater if I call it 1 a or a full name. doesn't matter if it has subtasks or not.Doesn't matter if I have Dates or it is blank. If I add a task in SharePoint and resync it will bring the task from SharePoint into Project and then popup the same error. I have a list with several specific columns within it. However, when I click the button "Open Schedule", MS Project does not come up with all of the columns I setup within the List. MS Project comes up with the standard columns. How can I make MS Project come with the same columns I have in my List (or View)? I see that synchronization with Project is multidirectional. Does anyone have experience making it unidirectional? My challenge is to compile about 25 projects into an integrated program plan, and then have the PM's sync their changes weekly. I'm trying to use one list to avoid using SQL reports to aggregate the data, but the obvious consequence is that it would push the aggregated data to each plan. Deal breaker! Unidirectional in which way? should not update back to their respective project plans right? Thank you for replying, Jeremy. I didn't think anyone would see my comment since the conversation was from 2012. Yes, I would like the info to flow to Sharepoint, but not sync back to the MPP. old post but trying my luck... created a task list in SharePoint Online and later when I try to open the tasks in MS Project 2013 using "Open with MS Project", the orders of the tasks are all distorted... tried adding a column for sorting but always opens with wrong order in MS Project... read something about the auto ID given by MS Project but don't understand why it won't take orders the way they are in SharePoint... help please! We have Project 2013 synchronising tasks well with SharePoint 2010 but with one problem. We have some custom fields which we've mapped to task list fields but for some reason every time we sync, a new version of the custom field appears in SharePoint with an identical name. I.e. Project field = "Developer" and the task list has 10 instances of "Developer" available as columns; Most have no data in them. Have you ever come across this issue before? Thanks for sharing this amazing article and i think you know about lucky patcher for pc and i think it works like a charm. Please post more article like this and i will visit here again. In this case, you are using PWA and the synchronisation to SharePoint (i.e. Project site), you cannot edit tasks list from SharePoint but only from PWA. Thanks for sharing this amazing article and i think you know about apps like lucky patcher and i think it works like a charm. Please post more article like this.